7.65 points at 37 votes (rank 165). Rombachs C64-Spieleführer 8 1986 - "Vote 2"
Gamebase64 10 2008 - "A Classic!" The red button was pressed! Being not a level in the real sense, the SAC (Strategic Air Command-Headquarter) creates an overview over the whole world. It serves to alarm U.S. commanders when nuclear activities are recognized. As soon as an atomic missile starts on the Soviet side, this will be recognized by the computer and the launching base will turn white. Additionally, target location and time of impact are calculated and displayed. The Soviet missiles are shown as four white dots that move towards the U.S.A..
High above the Earth floats the U.S. space station with its hangar, in which some "Stealth-Fighter" airplanes are kept. With the "Space key" you now change to the hangar and the actual game can begin. Now the defence of the country can finally start. Each pilot himself needs to manoeuvre his jet out of the hangar, which prooves to be rather difficult in zero gravity. As soon as the pilot has entered, the jet lifts up by itself and the player has now the possibility to give the desired flying direction to the jet. By pressing the joystick left or right you control the side driving gears and give the desired direction to the jet. The main driving gears are adjusted by pressing forwards and give the required push forwards. Joystick backwards is not equipped with any function and neither works as brakes. To brake you can only turn the jet fast and then push forwards. You cannot slow down the jet. As soon as the jet is near the hangar gate and you have won some height by pressing the fire button you press F7 , and the gate opens for a short time. Fly through it before it closes and you find yourself at the SAC headquarter. Here you can choose between two possibilites: an instant direct attack on the Soviet silos or first expand the own fleet with a few jets. The latter has the advantage that you do not have to switch to the hangar again after losing a jet in the fight on the ground. But you should also not take too many from the hangar, because if a launching base is destroyed, all jets need to go back to the hangar for a "Check-in" and you have to manoeuvre them out again for the next attack. Exception: If the hostile rockets reach their target (our bases) before you have destroyed the launching base, the jets stay out of the hangar. Attack is the best form of defence! The attack on the Soviet bases can start. In order to be able to reach the missile silos, you first have to dare a flight through hostile territory. Of course in low-altitude flight to avoid radar contact. And of course not without meeting resistance. The Soviets need to fight back our attack with an arsenal of missiles, tanks and warmth-searching "Cruise Missiles". Here you need to pay heed especially to the "Cruise Missiles", which attack from behind. You'd best avoid them in low-altitude flight, wait until they have passed, then shoot them from behind and collect some bonus points. The "Stealth-Fighter" is controlled in this levels as you would expect it from a jet. Joystick left flies to the left, joystick right flies to the right. Pulling the joystick back makes the jet rise, pushing forwards makes it sink lower. However, confusion can arise, as you fly from left to right, it might help to push the head a bit to the left and look at the screen from there to the right. Differences in the difficulty grades: Although you can fly into several objects, it is not possible with difficulty grade 1 to crash down to the ground. With difficulty grade 2 and 3 this looks different. So avoid every contact with the ground with the highest concentration. Having arrived at the missile silos, you see in the lower part of the screen the "Control Panel" of the SAC. With this we supervise when the impacts will take place. Time is short! So we concentrate fully on the "main silo" in the middle from which the missiles are shot. The main silo is protected by four more "control silos", to which, however, we should not pay much attention due to the time pressure. In the case you have enough time until the impact, we can attack also all other silos, which gets us additional points and jets. With the full fire power directed onto the main silo, we also have to take care of the hostile jets. All missile silos have a small loop-hole, into which you have to hit. When the "Stealth-Fighter" is on the right height it gets blue and you can shoot. If the main silo is destroyed, the Russians cannot fire any missiles from this base any more and the game switches back to the SAC "Control Panel", from which the next attack can be planed. 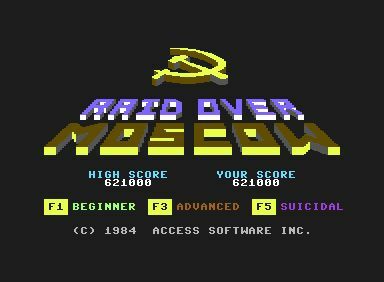 Tip: If you have enough time until the impact of the Soviet missiles, it is worth to attack the "control silos" first, as they have a high score and also give you "extra lives". The maximum number of "extra lives" that can be reached is 9. If all silos are destroyed there is another bit addition to your score"! So always attend to the SAC "Control Panel". Before you can finally attack the Soviet Ministry of Defence, the three circumferential hostile launching bases Leningrad, Minsk, and Saratov have to be destroyed. When they are destroyed you can start with the run on Moscow. Info: The main doors are determined by a random generator and is therefore at a different place each time. Disks of Tron sends its regards! The reactor room is guarded by a service robot, whose task it is to provide the reactor with the necessary coolant. If this supply is interrupted the reactor will overheat and explode and the nuclear catastrophe is averted. Of course this service robot is equipped with a cunning defence system, which allows it to determine your current position. As soon as it has determined it, it will open the fire. With his last powers our hero goes for disturbing the cooling process to get the reactor to overheat. As it is not possible to advance to the reactor itself, you use "disks", which are frisbee-like missiles with which the robot can be disturbed severely. The disks bounce of the back wall and have to be caught again. If the robot is hit in the back by such a rebounding disk, it can be damaged significantly. It can be a great help to have an aiming device in the shape of a black square. The number of disks and lives (heroes) that are available is limited, therefore it is very important here to stay on the move and catch all disks. If need be, it can be worth to sacrifice a life for a disk. The number of lives that you have is influenced by the results in the earlier levels. If the service robot is hit, its speed and aggression rises each time. If it gets hit four times, it is destroyed. If each the second to the last robot is eliminated, the actual problem arises: the last robot. It is so upset by the presence of our hero that it completely disregards the reactor! This is imminent to overheat anyway, which can be read at the ETCM display (Estimated Time To Critical Mass). If it is at zero the reactor will explode and the Soviet nuclear strike is history. Beware: The service robots must at all costs be destroyed before the time has run out and the "Critical Mass" point has been reached, because at the end you need enough time for the way back to the airplane or else your family will get notified! If the "American Hero" is in time back at the jet, he can finally make his way home. With patriotically raised chest he draws back the joystick of his "Stealth-Fighter" and glides into the evening sky while he dreams of street parades, rain of confetti and honour! Ask not what your Country can do for you......! The last screen tells you if you were victorious and how many heroes can be taken into the arms of their beloved at home! 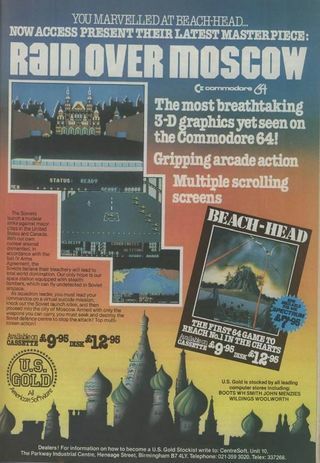 A bit nicer than the forerunner Beach-Head, which was released a year earlier, is Raid over Moscow in any case. Although the graphics are also here rather roughly pixelled and rather functional, the game seems more coherent. If this is due to the "Cold War Groove"...? Goodness knows! Somehow the James Bond movies of that time were also more exciting. This works only in the world map view and is defect in some game versions (crash). With C the game can be paused. If the game is not attended to for about a minute, it changes into the demo mode. The aim of the game is to tie up the main reactor and avert the Soviet nuclear attack. You find tips for each level in the section "description". 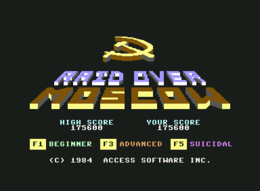 Rombach: "If you view Raid over Moscow as a normal shooter and disregard the background, then this is a perfect game of this type. The game is diversified, very difficult and the buildup is high class. It does not get boring quickly, as the first level is already a challenge, which cannot be mastered straightaway. But unfortunately the plot alludes to political problems and carries therefore a shady message. Can something like this still be seen as a game? Vote 2." Robotron2084: "Part 2 of the infamous war game trilogy by Access Software also focusses on the in Beach-Head already successfully used mixture of skill and shooting levels again, with slightly improved graphics. With success. What came out of this is a superbly politically incorrect game for an imaginary propaganda movie of the Ronny Raygun-era, in which at that time probably every Republican communist devourer would have rejoiced. 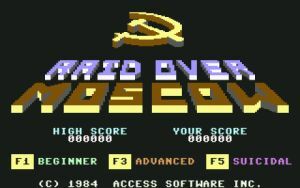 Here it is really piled on, with dark introductory story in the scroller and hammer and sickle emblazoned balefully on the title screen. If you can overlook this, you get served a difficult, gripping and atmospheric action game on a high level. Technically everything is tiptop for 1984, including adjustable filters for explosions and jet propulsion. I just played it again and what can I say? If you are sent into the dugout with the bazooka for the third time, because you have run out of "frisbee grenades", then you have really many drops of sweat on your forehead! 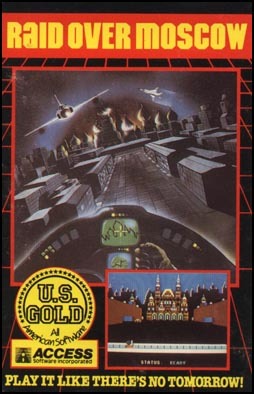 A hot game from the Cold War: 9 out of 10 points." Rockford: "Woah, tough go. From a time when Perestroika and Glasnost were still foreign words. (Ok, technically speaking they are still foreign words.) But it shows how Americans deal with their fear. About the game itself: it is my favourite of the three mentioned. The flying part is rather short, that comes in handy because I do not like this level. In return I like very much the reactor shooting, the dugout and the California-Games-level, whereby the last one can be cursedly (! ), CURSEDLY!!! frustrating. The start in the hanger at the beginning is quite nice, but if you get the hang of it, it gets rather superfluous. Graphically it is in my opinion better than BH 1 + 2, concerning the sound I miss the digital escapades, from which I on the other hand gadly abstain if I get a good game for it. 8 points from me. A higher vote is prevented by the hangar and the flying part." The indexing of the game was removed in Germany in July 2010 due to expiration (source ).